I just received this update from the "Justice for Mike Cho" listserv. If you're in L.A., please support. And please spread the word. safer for your kids and your kids' kids! Mehserle trial goes into deliberation this Thursday! or next Tuesday... Keep an eye out! Gather at Courthouse, 210 w Temple St, Downtown LA. KICKSTART SULU DC'S JULY CONCERT! 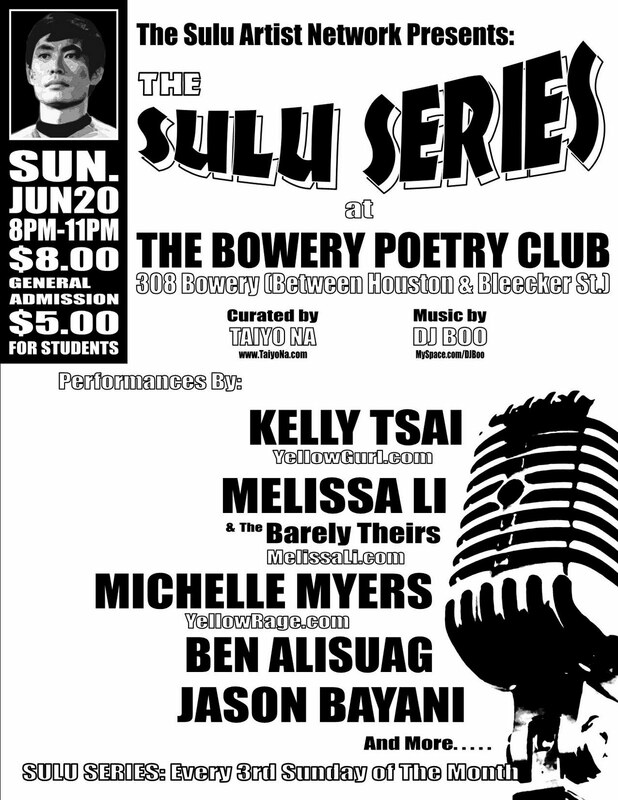 OMG, we only have until Sunday, June 20, to support SULU DC's July concert! Please pledge if you can! 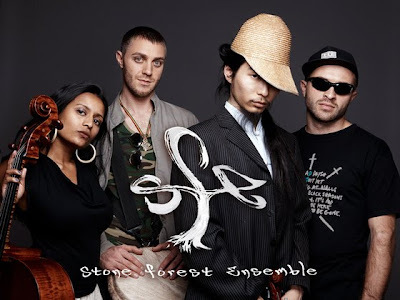 These are some amazing artists! 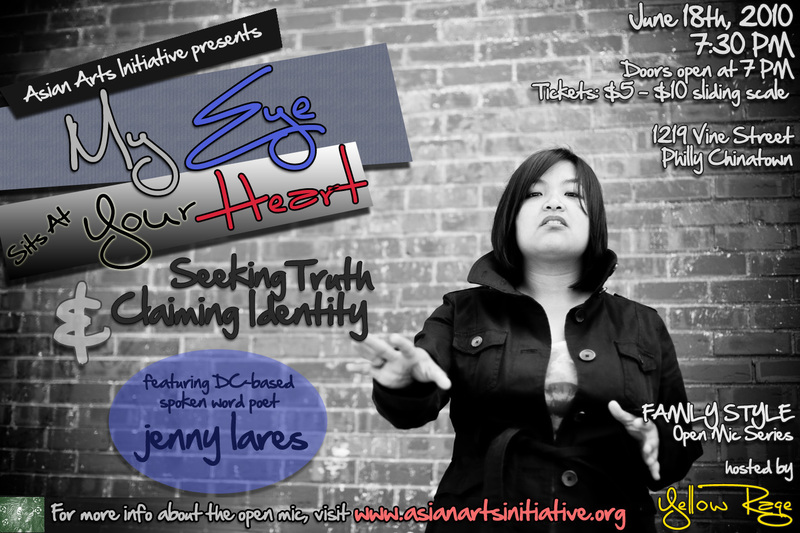 In November 2009, four Asian American idealists--Jenny C. Lares (spoken word poet), Brian Wang (co-chair of DC's Young & Powerful), Simone Jacobson (poet/dancer) and Regie Cabico (co-founder of NY Sulu Series, spoken word pioneer)--converged, gathering along their path Alex Cena (program manager, AALEAD) to form Sulu DC, an underground, grassroots network for Asian American and/or Pacific Islander American (AAPI) artists. On the third Saturday of every month, we host a performance showcase of emerging and established AAPI artists in music, spoken word, video, and multidisciplinary performances...but, July will be a special month and we need your help to make it ROCK! The Smithsonian Institution approximated that more than 350,000 Asian Pacific Americans live in the metropolitan area surrounding Washington, DC. In the U.S., there are roughly 30 Asian American and 24 Pacific Island American groups--perhaps with the 2010 Census, even more will be revealed! In short, AAPI folks have unique voices and experiences, and are in need of the support of audiences and backers like you to continue to be able to have a platform to use to share these stories. But, bands are expensive. We at Sulu DC want to continue to push the envelope and present quality arts to our national, inter-generational, multi-ethnic audiences. In order to sustain this, we need to gage interest and financial support through your pre-sale tickets to cover our costs (artist fees, sound, tech, venue, etc.) so that we'll be ready to launch the July show. WHAT'S IN IT FOR BACKERS? Any backer who gives $50 or above will have the opportunity to meet all of the acts as VIP guests of Sulu DC at the July 17 show. Additional give-aways will be announced throughout the funding cycle, including SWAG (stuff we all get) from Sulu DC's official outfitter, SNRG! HOW CAN YOU FOLLOW SULU DC'S PROGRESS? It's that time again--time for another amazing weekend of APIA performances at Family Style and SULU. UPCOMING: Friday, June 18, 7:30 p.m.
June's open mic theme is "MY EYE SITS AT YOUR HEART: Seeking Truth and Claiming Identity." 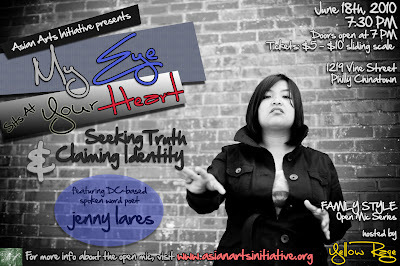 jenny c. lares is a poet and host based in Washington, DC. She is the Founding Co-Director of Sulu DC, an underground network and home for Asian American and/or Pacific Islander focused spoken word and multidisciplinary artists in the Washington, DC area. She is also one of the hosts of a weekly open mic at Busboys and Poets along Washington, DC's U Street Corridor. She has featured at Washington, DC poetry and art venues including Busboys and Poets, Artomatic, and Mothertongue, and has performed at several colleges and universities throughout the Midwest and East Coast. She previously served on the board of the National Asian Pacific American Women's Forum (NAPAWF)DC Chapter, where she coordinated and hosted "Creative Explosion V: The Spirit of API Feminism Through Performance". One of her poems will be included in the forthcoming anthology, Walang Hiyaliterature taking risks toward liberatory practice published by Carayan Press. 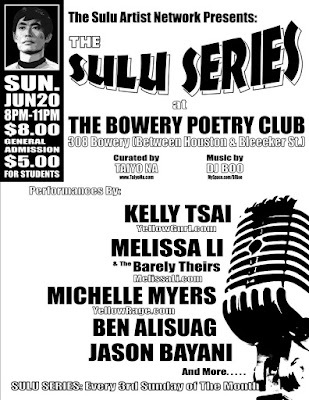 I'm performing at SULU NYC on Sun, June 20--with an incredible line-up of APIA artists! Anomaly won the Local Filmmaker Award during its recent Seattle premiere at the Langston Hughes African American Film Festival! The cash award is given to a filmmaker acting in a significant production role who resides in Washington State. Co-Producer Sharon Smith, based in Seattle, was in attendance at the festival with Director/Producer Jessica Chen Drammeh. For a video interview from the festival premiere, check out ALHLive.com. Additional photos are posted on Anomaly’s Facebook page. Each year, the LHAAFF strives to present creative, thought-provoking films that entertain and inform. Sharon and Jessica are thrilled to have presented Anomaly at the festival and honored to win the award. 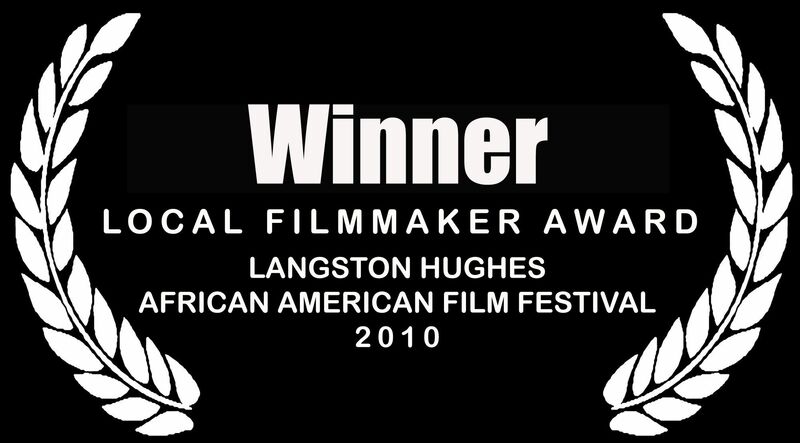 Other award recipients were Flags, Feathers and Lies (Jury Award) and Burn: The Evolution of An American City (Audience Award). "Anomaly" was eight years in the making. Director Jessica Chen Drammeh says she has struggled with racial identity previously in her life. (ALH Live!) -- More than eight years in the making, Anomaly is a documentary film that has all the promise of bringing to the social forefront just the kind of conversation we need. Is it controversial? Sure. Are there uncomfortable moments during its 47-minute run time? You bet. Even so this courageous debut by director Jessica Chen Drammeh offers an elegance with it's adversarial nature that is rarely seen in cinema today. Drammeh's narrative is contemplative, thoroughly informed and confident. She mixes her personal story with those of the documentary's subjects in a way that demonstrates clearly not only is she directing the film, but she is experiencing the film even as she guides the story. In terms of the documentary's subjects, one stand out is Gabrielle, a young lady of african-american and white descent who was taken from her mother at birth under the weight of the most unimaginable circumstances. Drammeh does a fabulous job following through with Gabrielle's story. Another is Michelle. A firebrand of a woman of asian and white descent that is unapologetic about her choice to marry a black man in the face of her family's very clear disapproval and unabashed racism. My apologies to the families of Fong Lee and Mike Cho for not posting these sooner. I've been very busy, but because I put this post off, I didn't get important info out about a forum that took place last Sat in LA about police brutality. I'm sorry I dropped the ball. This issue of innocent people--especially men of color: Asian, black, Latino, Native American--being killed by police is not new. For those of us trying to raise awareness about it, we know how difficult it is to get people to respond or to even listen to the truth that the people who have taken an oath to serve-and-protect are recklessly, maybe deliberately, killing our people. It has to stop. But we can only stop it if we recognize this as a common struggle and unify and demand justice. I'm posting updates from the families/spokes people of Fong Lee and Mike Cho. If you are not familiar with these cases, please research them. Read about them. Be outraged. Spread the word. Do something. Feel something. I will keep posting as I receive info. Just wanted to forward some media coverage and personal reflections/information regarding the court appeal this morning. Also, i just learned that Jason Andersen will be back on the force in as soon as one week, as he was recently exonerated from the domestic abuse charges filed against him last summer. Please check out the media links below –I’m sure many of them will continue to be updated within the next 24hours. I also just wanted to say that Fong’s mom and sister, Shoua, never cease to amaze and inspire me. When people were congregated outside of the court and organizer Janelle Lee was in the middle her speech to the media, Fong’s mom rolled up in a SUV and jumped out quick with 20+ rally signs. She started passing those bad boys out like they were $20 bills. When that task was done, she stood strong for the cameras and offered support to her family. Shoua provided a statement for the media and did a good job fielding questions even though (what I thought) she was made a last-moment spokeswoman for her family. How these women and their family continue to fight for justice, and offer so much of themselves in the process, is painfully inspiring. Let's continue to talk and make moves! extremely well-respected ex-LAPD Deputy Chief as an expert witness. some lunatic criminal and even suggested "death by indifference." make any logical sense, basically said whatever they wanted to say. Will kill you but we cannot just sit back and do nothing. Right?? mean for the rest of us? Aren't you outraged/scared/sad/anything? Aiyana Stanley-Jones by Detroit police, as they should be, as I am. PISSED??!?!?! Don't we need to do something??!?! best, we get a civil trial but even that is difficult to come by. hey, at least he ain't dead. There will be people in the courtroom as well as protesters outside. appreciate it. All you have to do is show up. Power in numbers!! opportunities to take a day or two off of work. going to set the precedence. We cannot let more killer cops go free. DeAundre Brunston, Oscar Grant shocked our communities. Police Violence needs Racial Profiling in order to be successful. police officer has been charged with murder in the line of duty. for Oscar Grant and others across race. 213-241-0244 or Thandisizwe Chimurenga at 213-321-0575. You received this message because you are subscribed to the Google Groups "Justice For Mike Cho"